Dr. Milo T. Pinkerton III of the Consortium of Genius has a very important announcement regarding THE END OF THE WORLD! What does it have to do with this website? You’ll have to watch the following 3 minute YouTube message to find out! So watch it now, and tell all your friends online about on Facebook, Twitter, etcetra! The MarsCon 2010 Dementia Macros Contest!!! U can has prizes for yer MarsCon pics wit the funneh kapshins! (1.) Make a Dementia Macro using a picture from MarsCon 2010. You can use one of your own pictures, or you can use somebody else’s (some people’s posted photo collection links are below). (2.) Post it at the Dementia Macros LiveJournal Community, http://www.livejournal.com/users/dementia_macros , sometime between now and Tuesday, April 27th at 11:59 pm CST. Enter as often as you want, but you will only be eligible for one of the top 3 places. The 1st, 2nd, and 3rd place winners will be announced sometime shortly after that on the internet in some way (I’ll decide which way would be best when the time comes). The contest will be judged by the MarsCon 2010 Dementia Radio Listener Guest Of Honor, Snapper! http://www.facebook.com/album.php?aid=153392&id=530260137&l=c3cbe57f9d – Th. & Fri. If you have a gallery of MarsCon photos you’re willing to donate to the 2009 Dementia Macros Contest, please let me know and I’ll add them to the list! Kthxbai! Luke & Moonbeam & Carrie & Blasted Bill’s Bad Pod Rapport Of Destiny: Episode 2 – Post-MarsCon 2010 Wrap-up Report! Well, the title pretty much explains everything you need to know, but I’m too OCD to not type something here, so here goes. It’s Luke & Moonbeam & Carrie & Blasted Bill’s Bad Pod Rapport Of Destiny, Episode 2, our Post-MarsCon 2010 Wrap-up Report! Recorded Sunday night March 7th in Nate Boi’s hotel room after all of MarsCon 2010’s activities had come to an end. We had a room full of friends & artists, including Brendan from Nuclear Bubble Wrap, Chris Mezzolesta of Power Salad, and Insane Ian who didn’t say anything during the whole episode. Perhaps he was deep in contemplation on which MarsCon T-shirt he should order from Spreadshirt. In any case, here’s 18 minutes of post-con-nal bliss. Enjoy! MarsCon 2010 Dementia Track T-shirt, Events, & Update! ORDER YOUR MARSCON 2010 DEMENTIA TRACK T-SHIRT! 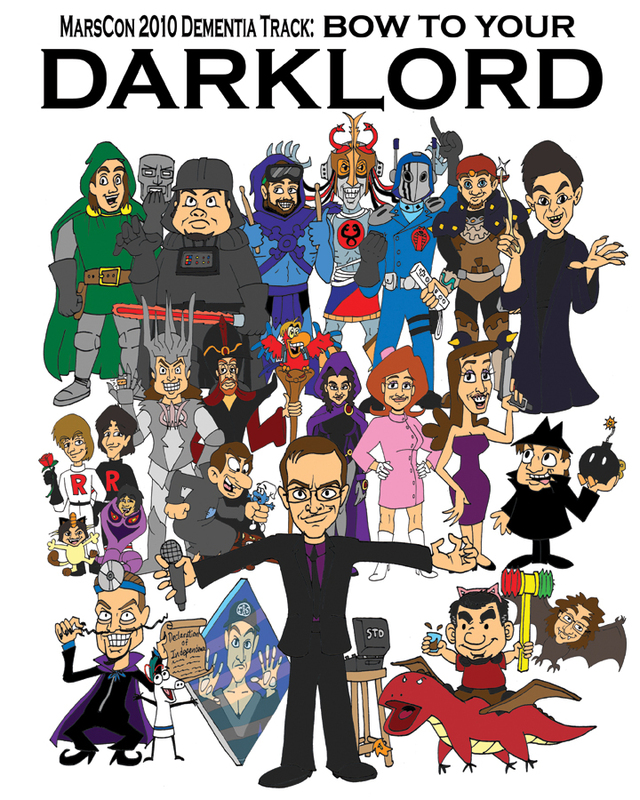 The full color MarsCon 2010 Dementia Track Dark Lords T-Shirt is now available! Order yours now, so you can have it shipped to you before you leave for the convention (because they won’t be available for sale at the convention). THE FRONT is a full color cartoon image of all of the 2010 Dementia Track performers as famous Dark Lords & Femme Fatales (illustrated by Luke Ski), THE BACK is a list of all of this year’s actsYou can also order previous year’s shirts there (Alien Invaders & Video Games), as well as MarsCon Dementia Fun Bus and Dementia Radio T-Shirts. You can also order previous year’s shirts there (Alien Invaders & Video Games), as well as MarsCon Dementia Fun Bus and Dementia Radio T-Shirts. THE SPACE ODDITY BREW CLUB & PUB! We’ll stay open afterwards for music and conversation! On Friday and Saturday we’ll have keg beer and various types of homebrew, appetizer-y stuff, cookies, and who knows what else. Various board and card games will also be available – or table/chair space if you’d like to bring your own. We are very grateful to the people who have donated money, time, or food to the party already. However, we’re only about halfway to our goal, so please check out this link for information on how to donate if you are so inclined. THE DEMENTIA RADIO ROOM PARTY! Once again back is the incredible Dementia Radio Room Party! This year it’ll be in Room 1313 (right next to Party Rob Balder’s ERFWORLD Room Party in Room 1314). There will be drinks and snacks, comedy music, casting over the internet airwaves on Dementia Radio, and our annual installment of Dementia Smackdown Wrestling! Come see our virtual combatants face off on the digital screen and cheer for your favorite MarsCon 2010 Dementia Track act! Live commentary provided by DSW Commissioner J.P. Tuesday and Duke “Flyboy” DuJour! 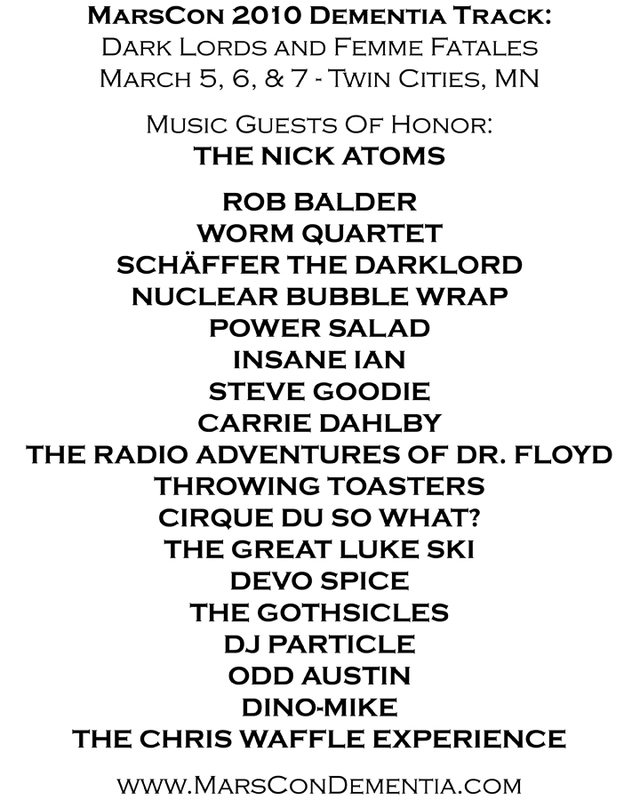 Day & time of DSW is TBA, we’ll put up signs in the Dementia Radio Room Party once we figure it out. And while you’re on the 13th floor, don’t forget to visit KARAOKE JOE’S in Room 1306 where Ben, Dov, and the crew will be serving up Karaoke until the break of dawn and beyond, and THE A.V. CLUB movie room in Room 1340 where Earl ‘Wyngarde’ Luckes will be playing cinematic delights to tantalize your eyes! MYSTERY SPATULA THEATRE 11: “DUNGEONS & DRAGONS”, WITH BONUS LIVE SHORT! Saturday morning at 10:00 am in the A.V. Club Movie Room (Room 1340) we will again be showing an episode of Mystery Spatula Theatre 11, this time it’s “Dungeons and Dragons” starring Jeremy Irons. This episode was released a few years ago, so to provide some new MST11 content for all of you, Matt, Carrie, and Luke Ski will end the 2-hour block by riffing live on a new short! It’s a safety-in-the-workplace film from the 70’s, and it’s ripe for the riffing! (Short with live riffing will start at approx. 11:40 am) So come on out and start your day with Mystery Spatula Theatre 11, or Jeremy Irons will come to your house and yell angrily at you! It turns out that Chris Waffle of “Hot Waffles” will be able to attend MarsCon this year! 🙂 So we’ve added the solo version of his act “The Chris Waffle Experience” to the schedule on Sunday from 2:30 pm to 2:45 pm, just before the Dementia Smackdown which will now be from 2:45 pm to 4:00 pm. Also, due to a booked Saturday night gig in NYC, Schäffer the Darklord’s show has been moved to Friday night. So please refer to the Dementia Track Schedule page of this site for the revised schedule. Thank you. The MarsCon 2010 Dementia Track Fund Raiser CD/MP3 set is now on sale! The set is comprised of tracks recorded live at MarsCon 2009, and includes music by Rob Balder, Possible Oscar, Positive Attitude, The Nick Atoms, Devo Spice, Worm Quartet, Power Salad, the great Luke Ski, MC Lars, The Feng Shui Ninjas, Wally Pleasant, participants in the Dementia Fan Showcase, DJ Particle, Carrie Dahlby, Marc Gunn, W. Randy Hoffman, Beth Kinderman, Soggy Potato Chips, and Insane Ian. If you’re interested in hearing a PREVIEW of the 2010 Fund Raiser set, I’ve created a special 30 minute PodCast that you can listen to and/or download for free by CLICKING HERE. For the track listing and more details, CLICK HERE. The winners of the MARSCON 2009 DEMENTIA MACROS CONTEST!! !